How Can Acronis True Image Small Office Solve Your Problems? Acronis True Image Small Office Review with pros and cons of the new Acronis software for small businesses. If you worry that your business date might get loss, Acronis True Image Small Office is the right thing for you. Basically, it works in a way that you back-up your date to external drives, to a network location, or to the Acronis Cloud. There�s an even better option - to back-up the date on all three! With Acronis True Image Small Office, your data is safe and always available to you. No one else can get a hold of it, unless you give them your approval. You can access the data from any device you wish, simply by using your user name and password. Those devices include all from personal computers and laptops to smart phones and tablets. 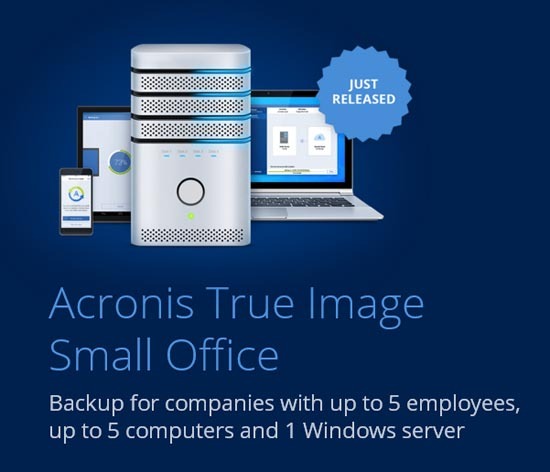 Unlike other ways of back-up, Acronis True Image Small Office goes all the way. Instead of just copying files from your hard drive to external storage, this software does a full disk-image backup. That means that you are enabled to restore all of your files and folders, but also all of your apps and even the operating system. 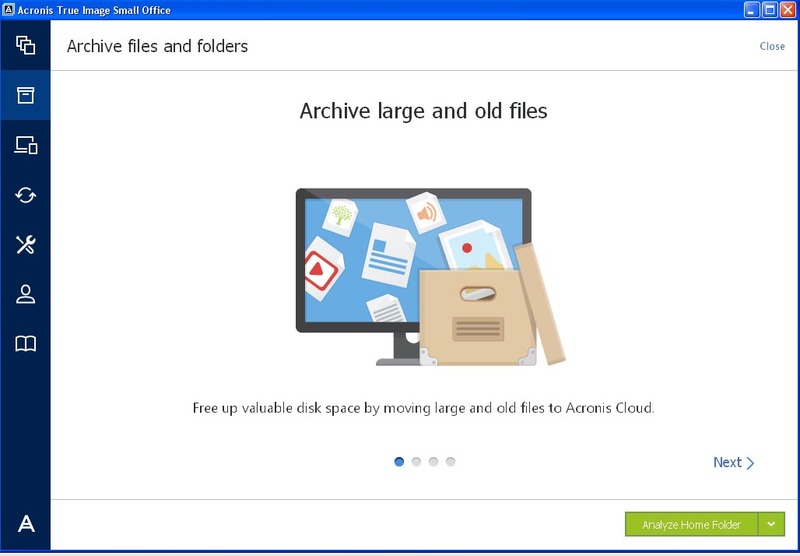 A great thing about Acronis True Image Small Office is that it allows you to choose what to recover. If you don�t need certain things, simply ignore them and recover the rest. The program keeps a history of your system, so you can recover the date to a certain point of time. The basic package of Acronis True Image Small Office comes with 100GB of cloud storage, but you can always purchase more. 250GB, 500GB and even 1TB are available. Acronis True Image Small Office comes with a storage space of 100GB, which should satisfy the needs of most small businesses. Unlike similar data backup programs, this one is not simply copying the data on your computer, but doing a full disk-image backup, which means that Acronis True Image Small Office will store every single thing you have on your computers. That way, you are fully protected and have nothing to worry about regarding data loss. In fact, once you back up your date, your Acronis account will be more valuable than all of the devices in your office. 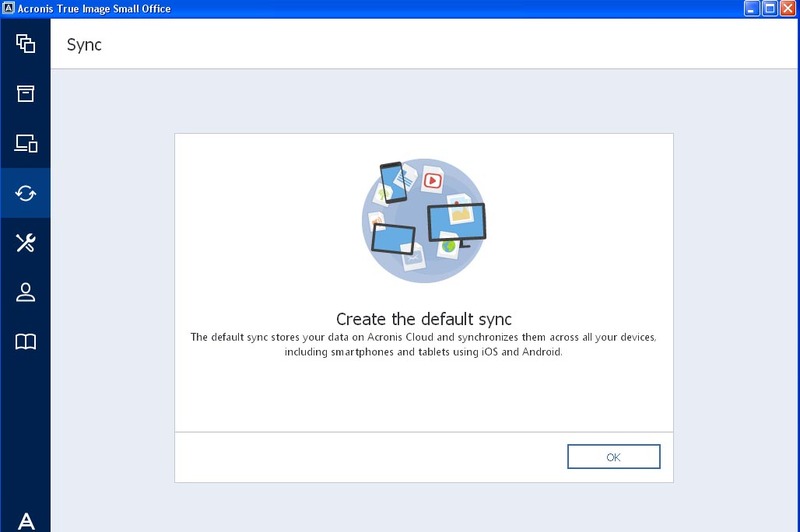 In cases when you change devices, you can use Acronis True Image Small Office to move your data, because it offers a universal restore. That means that when you get, let�s say, a new PC, you will not have to copy all the data from your old computer. Simply use this software to move all files, folders and apps to the new computer. A lot of users are appreciating one particular Acronis True Image Small Office feature, which allows them to roll back to different points in time. If you�ve made some mistakes on your PC, you can simply come back by using this software. You can also pick which files and apps to recover, which to leave on the cloud. Another good thing about Acronis True Image Small Office is that it takes care of your privacy. The data is protected with 256-bit encryption, which assures that only you can access it. When it comes to cons of Acronis True Image Small Office, the most obvious one is its price. It is among more expensive software from the Acronis family. You can get other packages for less money, but with this one, your small business data is completely safe. When you compare the cost of lost data with the price of Acronis True Image Small Office, you see that getting this software is the right thing to do. Another thing that bothers people is that the basic package comes with 100GB. That should be enough for most business users, but those who require more space will have to pay more. For example, 250GB of space is 19.95 Pounds per year. �Better safe than sorry� should be the motto of all business owners. The cost of losing the data can be so huge that your business might never recover from it. You should look at getting Acronis True Image Small Office as a part of the business expenses, the same way as you look at anti-malware protection programs. Having a backup is a must for any serious business owner, but why should you choose on getting Acronis True Image Small Office? The reason is that there isn�t a backup program that has proved to be great as this one. The backup has been on for nearly a decade and thousands of satisfied customers are a guarantee that it�s doing a good job. There are three hundred software engineers employed by the Acronis Company, who are working on the codes that ensure the safety of your data. Right now, there are over 2 million lines of codes that make this technology stand out from its competitors. 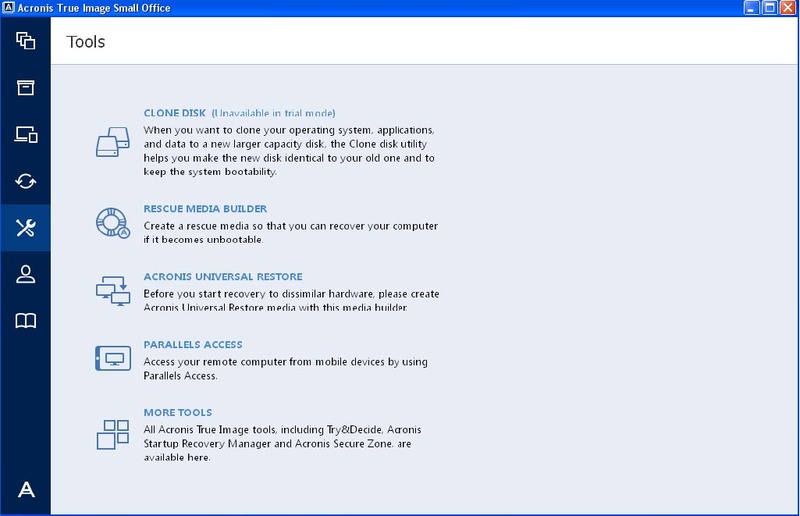 Before deciding to purchase the Acronis True Image Small Office for one year, you can try it out for free. Simply download the free trial and whether you need this program or not. In most cases, people decide on buying it straight away. The bottom line is that if you are an owner of a small/medium business that employees up to 5 people, you should not think too much about backup-ing your data. Get yourself Acronis True Image Small Office as soon as possible!